Couple events have occurred over the past few weeks that had me thinking about how my work is interpreted and used in various hockey-related discussions. I figure using this blog as a platform would be the best way to summarize my thoughts on this matter, and clarify any issues that arise in the future. This always makes me cringe. For the simple fact that “analytics” is used so interchangeably, especially in hockey, that I often have to re-familiarize myself with the concept. To me, analytics is the process of collecting raw data, refining it, applying different models, finding correlations and ultimately, looking for some sort of pattern to make a decision on. I do some of this, but leave the hard work to people who know what they’re doing. My approach is to start with a question and then find the data that’s already been scraped from NHL.com and aggregated in an easy to use format. Thanks to websites like War on Ice, Hockey Analysis, Behind the Net and Natural Stat Trick, all I have to do is find the metric that’s been derived from the analytics (i.e., Corsi, Fenwick, etc) and apply it to whatever question or topic I have. I do look for patterns. I do look for correlations. But the bulk of the work is done by real analytics-type people with backgrounds in computational science and statistics. Once I have the data, and run my analysis, I try to explain in 750 words why my topic matters, what I found and what I think the next steps are. Now this one is relatively new. Last week when Mark Fayne was put on waivers to be sent to the AHL, I openly questioned how Eric Gryba was any better than Fayne. Without a doubt Fayne has struggled mightily this season, even getting benched at times and healthy scratched. But I still consider him ahead of guys like Gryba and others for the simple fact that he’s a proven player and has more experience playing against top competition. Gryba has not looked good to me at all, and does not appear to have the ability to move up and down the lineup like Fayne would. For what it’s worth, my own analysis found that Fayne wasn’t shooting at a frequency that McLellan expects from his defencemen, and this might be why he’s been waived. Now I do look to shots and shot attempt data mainly because it’s a good indicator of possession and has been reviewed and analyzed by some very bright people (Arctic Ice Hockey, Pension Plan Puppets, SB Nation to name a few). It’s not perfect and can’t answer every question, but I have my reasons for using it. First off, shots and shot attempts tend to be the best metric for the question I have or the topic I’m exploring. My thoughts aren’t that overly complicated, so I can typically track down the exact data set I need rather quickly, without having to using any modelling to test correlations. If I can’t find the dataset, I ask around. That’s how I found things like Ryan Stimson’s passing project or Corey Sznajder’s Zone Entry project. Quick note: What I stress to anyone who’s looking into any sort of analytics, whether it be hockey or business, is to approach the data with specific questions. And be ready for continuous analysis and discussion. Analytics does not provide any sort of final answer. In my opinion, the best analytics articles are the ones that leave you with more questions. I also like the shot data because it’s readily available to anyone and everyone. Using a data source that’s used by many other people gives my work some credibility and also makes my work verifiable. Having said all of that, I’ve always remained open to new metrics that have some thought and explanation to it. Hockey analytics is only in its infancy, so I expect people to collect and aggregate data which can only push the discussion along. Examples include dCorsi, Dangerous Fenwick, xGoals and the results from manual data collection projects. So should using metrics such as Corsi or sharing the work of others who use Corsi make me a “Corsi Guy”? Hardly. This one sounds all warm and fuzzy, but it’s been used as a way to put down a whole group of people when really the target might be one or two. Another problem with this phrase is the generalization of the intended participants. There are some in this community that are the actual statisiticians who parse through and test the data. There are some that do the aggregation (i.e., War on Ice). There’s the visualization people. And then there are those that have an understanding of the data and just like reading articles about it. So when someone says “Analytics Community”, I really have no idea who this is referring to and tend to ignore the rest of their issue. And finally, there is a lot (a LOT) of disagreement among fans when it comes to the application of analytics to hockey. Player A might look great to one person using this metric, while Player B might look better using another metric. But when someone says “Analytics Community”, it sounds like everyone is on the same page have come to the same results. There are a few local media types, ones that work full time for one of the major outlets, that tend to stir the pot to draw extra attention to their work. We know this is part of the game when it comes to covering sports in Edmonton. A lot of it is what I refer to as scripted ignorance. For instance, taking a shot at the “analytics community” is a good way to get under the skin of a lot of people and draw attention to themselves. It’s usually the same three or four local reporters that tend to do this. This doesn’t bother me because statistical analysis has been done for a long, long time. It’s a way for fans to get into the game and it helps to add to the discussion. Plus, the beauty of modern communication technology is that individual fans create their own little ecosystem and control what information they receive, create and share. What does bother me is how the rest of the folks who cover the game get lumped with the few ignorant ones. Outside of our Oilers bubble, “Edmonton Media” does not have a good reputation, which isn’t fair to the individuals who actually do make a conscience effort of expanding their scope to include analytics. And the reputation of Edmonton being a tough place to play is warranted, but has been driven by a lot of the garbage content produced by the few. If you’re interested in analytics, Jason Gregor hosted a roundtable on TSN 1260 featuring Lowetide, Darcy “Woodguy” McLeod and Michael Parkatti. The group discussed some of the key metrics, how they’re applied, and what some of the limitations might be. Below is a link to the audio. I’ve always been interested in the metrics that have been derived from analytics such as shot shares, Corsi and PDO. So it’s always great to hear that more people are interested in it and are raising new questions to consider. Digging into the numbers is a big part of being a modern-day fan. It reflects the curious nature of human beings, pushing the knowledge and information that surrounds the game of hockey. For me, numbers are especially useful when confronted with bogus hockey information and speculation. Years ago, we would hear about trade rumors for instance and often take things for face value. Now, we can quickly dispel some of the bad information by knowing things like salary information and on-ice data like time on ice. It’s important to consider that this additional layer of analysis can be misleading if taken out of context. This is when individuals have to take an active role in critically assessing whatever information is presented. If interested, below are a few of my go-to sites for hockey data derived from analytics. And just to be clear, this type of analysis isn’t for everybody. If analyzing the data and metrics doesn’t enhance your enjoyment of the game, don’t worry about it. The numbers really are a way to get into the game and supplement some of the discussions we have on a day to day basis as fans. The best way to make use of the data is to come in with questions and be willing to expand your scope of knowledge and understanding. Analytics really is a continuous process and should never result in a final product. In case you’re interested, below is a presentation that I organized last year on hockey analytics at the University of Alberta, featuring Michael Parkatti who provides an outstanding summary of analytics. Had the opportunity to be a guest on Inside Sports last night. Host Reid Wilkins invited me on to discuss analytics and the enhanced stats that have been released by the NHL. There are tons of good articles that provide an introduction to analytics and advanced stats. This one from Sports Illustrated gives an excellent primer on Corsi, Fenwick, PDO and QualComp. The best website for advanced stats is War on Ice. Has everything you need, excellent functionality (i.e., filters), easy to use, and has an excellent glossary. HockeyStats.ca is also pretty solid, as well as Nice Time on Ice. New data visualization websites are popping up every week, so it’s worth keeping an eye on. A few of the original blogs/websites that pushed the growth of analytics were Behind the Net, Irreverent Oiler Fans, Objective NHL and mc79hockey.com. A couple of those sites have been taken down as they’ve been hired by NHL clubs. Reid and I briefly touched on Taylor Hall and how his possession numbers align with his boxcar stats. Ryan Batty of the Copper and Blue had an excellent piece from last season that covered this: Taylor Hall – Points vs Corsi. We also discussed shot quality, which I would argue is good to know, but doesn’t predict future outcomes as well as Corsi/Fenwick. This piece by Eric Tulsky at NHL Numbers explains the correlation differences. Nick Mercadante of Blue Shirt Banter also has a solid post on this. If you’re wondering why Boyd Gordon is the Oilers MVP, please read this excellent piece: Boyd Gordon – Superhero. 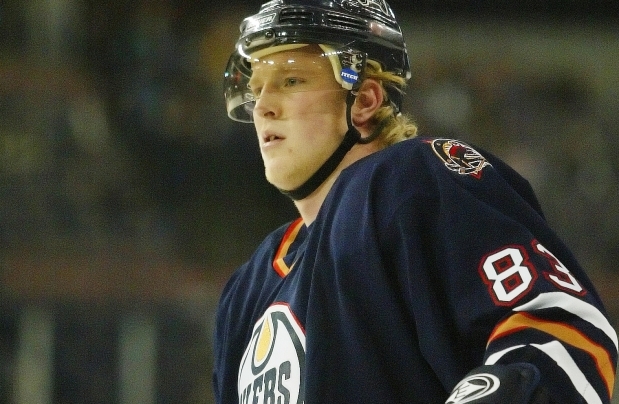 Shawn Horcoff was accustomed to doing a lot of the heavy lifting as an Oiler. Prime example of a solid two-way centerman who went up against the best players in the NHL and started often in the defensive zone. My research at the University of Alberta focused on hockey fans and their online collaboration to develop new information and knowledge pertaining to the game. You can read more about it here, or access the full research paper. Also recommend reading my post Finding the SuperFan. Michael Parkatti and I put together a public lecture at the U of A last year on hockey analytics. You can watch the full session on Livestream. I touched on a few of the reasons why analytics was significant and how fans are really the drivers of new information and knowledge. More of my thoughts can be found here: Importance of Hockey Analytics II. Thanks to Reid for having me on his show. Definitely a unique experience! Being a terrible hockey team for almost a decade impacts a lot of things. The low morale of fans, the constant trade rumors and bogus narratives, and the negative perception of management and owners are all tied to loser franchises. These are things that can easily be reversed if the team starts winning, but unfortunately, that isn’t happening any time soon. And as the playoff drought continues for the Oilers, the history of a franchise also starts to get diminished. There’s this notion that the Oilers have been bad far past the 2006 cup run. The narrative makes sense: they were the 8th seeded team that barely made the playoffs in 2006 and beat out Detroit (1st), San Jose (5th) and Anaheim (6th) to get to game seven of the finals. Following the loss to the Hurricanes, the team went on to missing the playoffs nine straight years. Add it all up, and you could safely assume that the 2006 run was a complete fluke. That Northwest division was quite the killer that season. All five teams had points percentages above 0.500. No other division was as this tight. The Oilers needed 95 points to qualify for the playoffs and were only four points back of 5th place San Jose. The club ranked 14th on the powerplay (18.1%) and 8th on the penalty kill (84.1). Here’s a high level snap shot of the Oilers’ advanced stats from the 2005-2006 regular season. I took into account all situations and found a comparative team from the 2013-2014 season based on rank. Regular season shot attempt data is worth reviewing, as it’s been a pretty good predictor of championships. The Oilers put together some fantastic numbers over a full season, and compare well to some of the more recent top teams. The Oilers were a strong possession team over 82 games and had the sixth highest offensive zone starts. The team allowed the fewest shots in the league, but had the worst on-ice save percentage. That of course impacted the PDO, which was one of the lowest in the league. Worth noting that the Avalanche, who finished 7th overall, had the second highest on-ice shooting percentage (11.4%), while the 6th seeded Ducks combined their excellent possession stats with the sixth highest on-ice save percentage (90.9%). The weakness of the Oilers that year was definitely in goal as the club struggled all season to get consistent performances. The goaltending was pitiful with no clear cut starter all season. Only two shutouts registered in 2005-2006, while the Flames got 10 from their keepers. It was finally at the deadline that Lowe acquired Roloson from Minnesota for a first round pick and sent away Morrison (waivers) and Conklin (AHL). Piecing together these stats is really just a way to get a fair assessment of what the team actually was ten years ago. The narratives grow and evolve over time depending on the context, so it’s critical to ground our understanding of the game in some degree of quantitative evidence. A blend of the advanced stats derived from analytics with the standard boxcar numbers of the players give a much better assessment of the team’s regular season success. If there are additional stats or stories from that season worth mentioning, let me know. The NHL recently announced that they’ll be adding some of the “advanced” stats to their website for fans to access. These stats have really been developed by online hockey fans since about 2005 thanks in large part to people like Gabe Desjardins and Vic Ferrari, whose websites developed the core principles of hockey analytics. Over the past few years, the field of hockey analytics has grown to the point where many of those who pushed the discussion on analytics are being hired by NHL teams. The field is still in its infancy as the data collection tools and application of the analysis to game situations is still developing. The NHL involvement with collecting data and publishing it on their website has been long overdue. While they continued expanding their traditional stats, fans developed their own websites and blogs that collected game-data (using NHL.com) and aggregated advanced stats. Fans worked outside the traditional model of information consumption and became sources and distributors of information themselves. Blogs especially played a critical role as fans discussed the stats, collaborated and developed strong information networks. Compared to any other type of fan (i.e., comic book, movies, celebrities, etc), sports fans spend the most time and energy on their fandom. They are connected before, during and after games by reading articles, playing fantasy league, consuming content (TV, radio, web). They’re a big reason why mobile technology is the beast that it is today. The web is a magical place that allows human beings to develop social networks to break down the barriers to information. If people want information, they will get it. The web is just designed that way. When an online community is connected to one another by something that they are truly passionate about, they’re extremely generous with their time and energy. Hockey bloggers are intrinsically motivated to not only produce content, but also share their support to others. Knowing what we know about online hockey fans, it would be a huge mistake for the NHL to charge fans any sort of fee to access hockey data. The league has already taken steps to restrict fans from scraping the data from NHL.com and using it for their own websites. Becoming the sole source of data is likely their ideal vision, but they have to find a balance to ensure they play a role in the field of hockey analytics. Analytics is an excellent tool for fan engagement, so it would be in their best interest to keep the data open, easy to access and easy to use. Professional sports leagues should really want their fans to be informed and to develop knowledge to whatever level they want. The league is much better served if they have a fanbase that’s free to interact with data, push any sort of hockey discussion and share their thoughts across their networks. That’s what fan engagement is at its very core. To put up any sort of barrier, whether it be a fee for data or technological restrictions, would be detrimental to the overall interaction between the game and its fans. Knowledge and information will always be free. The barriers and the traditional models to keep data and information from the general public have been dropping in every aspect of our social world as the creativity of human beings will always get what it wants. Think of the illegal downloads of music and films; the open data projects of Governments and the death of encyclopedia books. If the NHL does try to restrict access to data, you can be sure that fans will work together to collect the data themselves. The tools are available, the network is already established and the motivation for people to participate will be high. There are also companies collecting data of other sports that can quite easily adapt for hockey and begin collecting data at a much larger scale. Really, the NHL doesn’t stand a chance if they put a barrier to their data. Shirky, C. (2010). Cognitive Surplus. New York: Penguin Press.